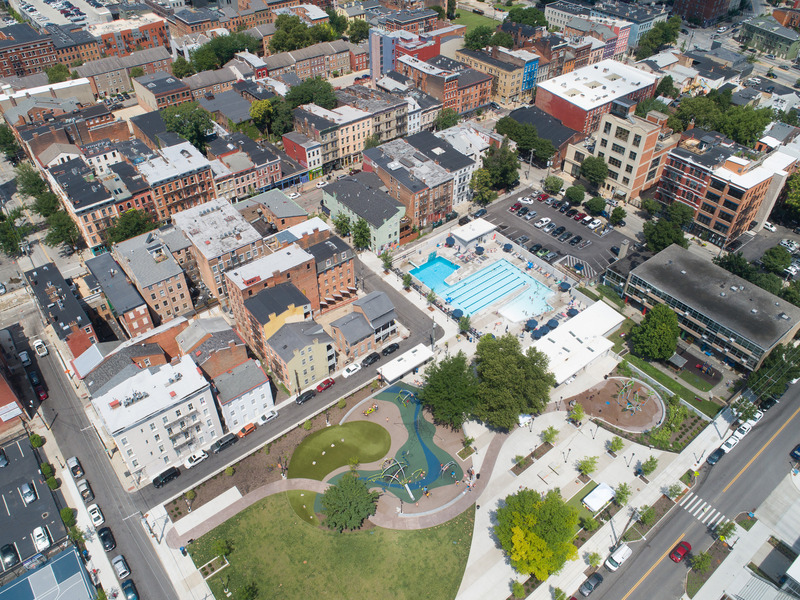 Since its inception, the revitalization of city-owned Ziegler Park has helped to foster not only a stronger sense of community but also an increase in investment and development in the Over-the-Rhine and Pendleton neighborhoods. The park straddles Sycamore Street between Thirteenth and Fourteenth streets and for many years was a poorly maintained, crime-ridden hub for drug activity. However, in 2012 Cincinnati Center City Development Corporation (3CDC) approached the City of Cincinnati with the idea of redeveloping the park in an effort to combat the disinvestment the area had been experiencing. Soon after, a team was put together through the Cincinnati Park Board and the Cincinnati Recreation Commission (CRC) to gather community input on a new vision for the public space. The project broke ground in January 2016 and was completed during the summer of 2017. The massive $32 million transformation allowed Ziegler Park to expand from 1.5 acres to 4.5 acres and also included a game grove, pool, sprayground, basketball courts, children’s playground and a 400-space underground parking garage. One of the most significant additions to the park–and to the neighborhoods of Pendleton and Over-the-Rhine in general–has been the brand new 400-space parking garage. The garage helps to alleviate some of the parking challenges experienced by residents, business owners, and visitors and even displays the amount of open spaces left in real time at the entrance to the garage as well as on the Ziegler Park website. Since November 2015, when the Cincinnati City Planning Commission recommended approval of the park revitalization, the properties surrounding the park have experienced a wave of momentum. Over 30 building permits that have been issued to date for repairs or alterations within a quarter mile radius of the park. Some of the more notable projects completed include the addition of new businesses adjacent to or near to the park. The Takeaway Deli & Grocery, Pendleton Parlor Ice Cream & Cookie Dough, Boomtown Biscuits & Whiskey, The Pony, Allez Bakery, Brown Bear Bakery have opened or are slated to open later this year. Rosedale, Revel, The Hub, Treehouse Bar, Longfellow, 3 Points Urban Brewery round out the list. The additional parking capacity has also allowed office projects like the new Empower MediaMarketing’s new office location on 14th street to be constructed. The enhancements alone have provided the community with a space to gather, play, relax, and enjoy the outdoors. In addition to these improvements, the Everybody In program helps maintain Ziegler’s commitment to inclusivity by making pool memberships affordable regardless of income. The program also provides free programming for youth including swim lessons, summer camp, and basketball games. The Everybody In program receives its funding from Procter & Gamble (P&G) and the Ohio Capital Corporation for Housing (OCCH). The revitalization of the park coupled with its accessibility has increased the amount of foot traffic in the area, which in turn, has bolstered the economic development of the community overall. Now considered a neighborhood asset as opposed to a challenge, Ziegler has become a destination for families and individuals coming from a variety of backgrounds and incomes. For example, the creation of the Rhino’s Swim Team is one of the many opportunities that arose from the revitalization of the park. The team, focused on community youth, has no registration feel and is supported through donations. Although Ziegler Park’s dramatic transformation is probably not exclusively responsible for the boost in economic development in Over-the-Rhine and Pendleton, it is fairly safe to assume that this revitalization has been catalytic. What was once a hub for crime and drug trafficking is now a safe community space that is accessible to all incomes and provides the neighborhood with assets that are essential for a higher quality of life. The redevelopment of this public space has proven that its value extends beyond the boundary of the park itself.